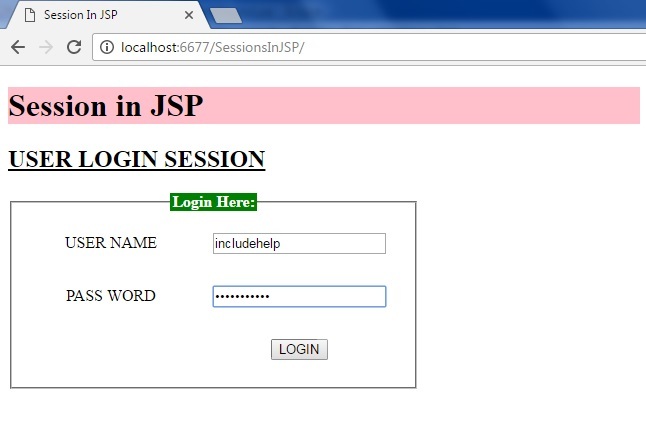 In this tutorial, we will learn how to set the User session, validating the user details at the time of Login using JSP? For every user there will be a particular session, here we are validating the details of a user and setting the user in a session and finally we are invalidating the user. Here we are taking the input from the user and triggering the action to validate.jsp on submitting of the form. Here we are validating the particular user by getting the input values, and sending them to its respective pages. Soon as the validation done, if the user is authorized according to our condition will be redirected to login page else forwarded to the same login page. Here we are just invalidating the user so that the values in the session would be invalidated. NOTE: If you want to check clearly, try to run logged.jsp soon as you logged out, you will be redirected to login page. Hope you understood.